When you own a website, analyzing and tracking your site’s traffic is critical. Knowing where your viewers are coming from, what days they come the most frequently, and how long they’re staying are just some of insights that you can use to help improve your site and inform your decision making. If you are using Google Analytics for web site usage tracking and digital measurement, we have great news for you. Now you can use Power BI to monitor, explore and visualize your Google Analytics data. 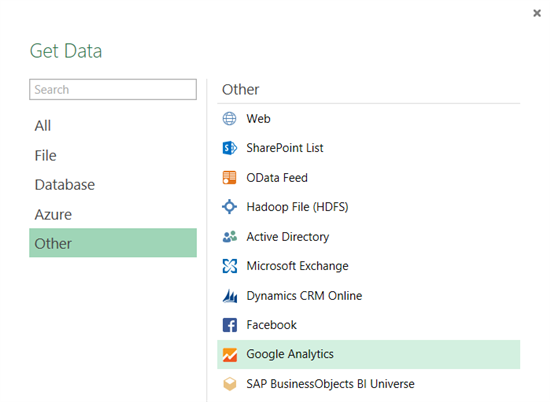 With an out of box content pack, you can connect and gain insights into your data immediately. 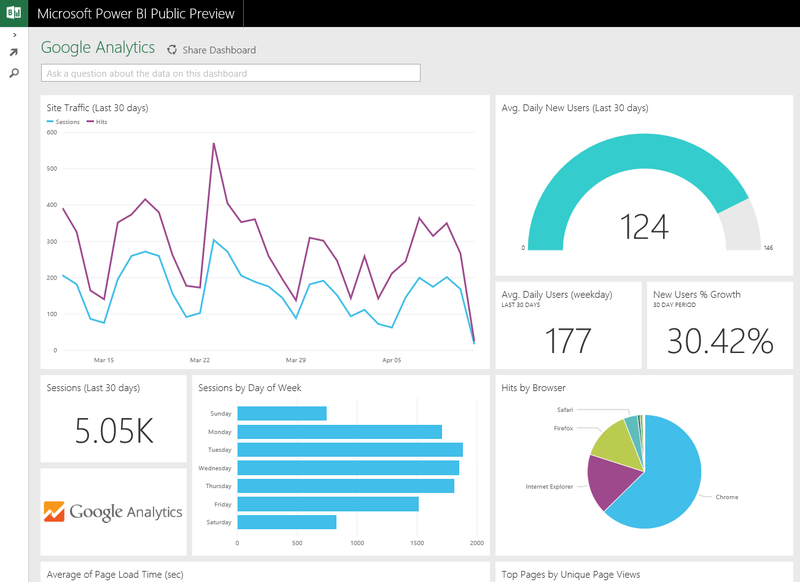 You can also connect directly through the Power BI Designer, allowing you to build your own reports and even create mashups with other sources that are important to you, ensuring all your data is in one place. 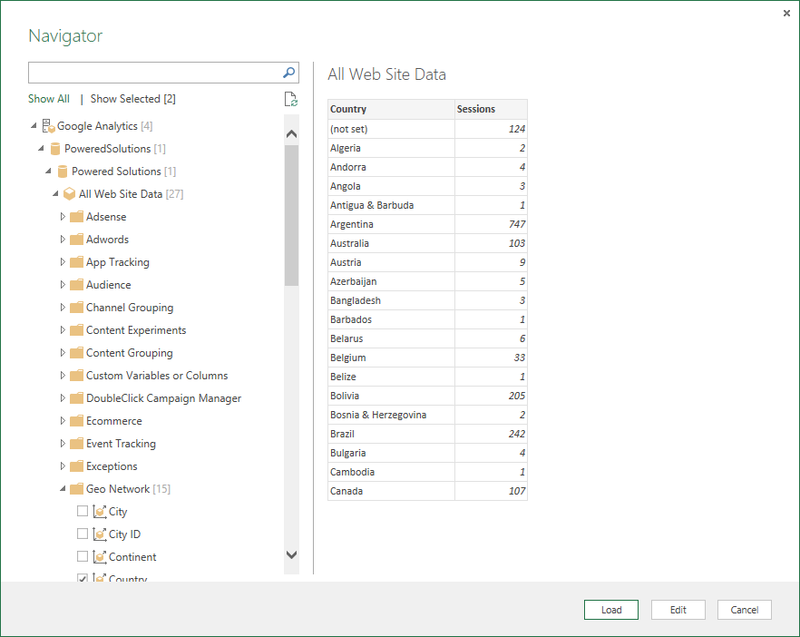 Connecting to Google Analytics in Power BI is easy; immediately after you connect you’ll gain insights around the usage of your site in the last 6 months. Using the Google Analytics API, this content pack provides a dashboard, a report and a dataset to allow to you monitor and explore your data. 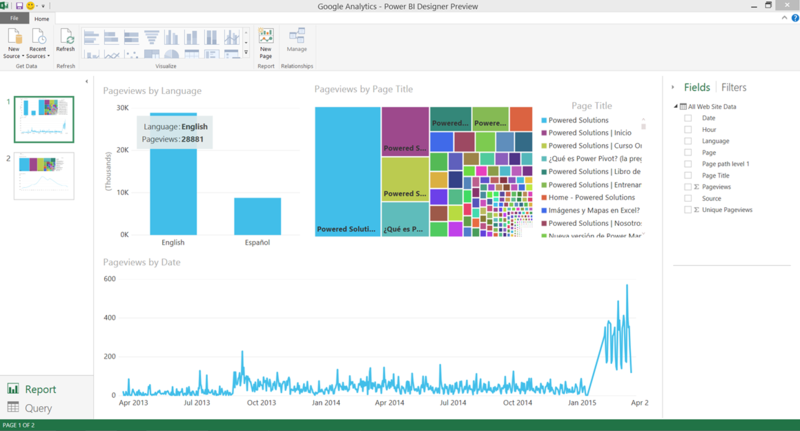 Miguel Escobar from Powered Solutions is an avid Power BI customer and was very excited to hear we had support for Google Analytics. Connecting through his account, his out of box dashboard looks like the one below. When connecting you can choose the account, property and view to connect to. This information can be found in your Google Analytics account, under the Home tab. After connecting, your data will start to load into Power BI and you’ll be notified when your dashboard is ready. Selecting one of the tiles will drill into the 5 page report built on top of the data set. 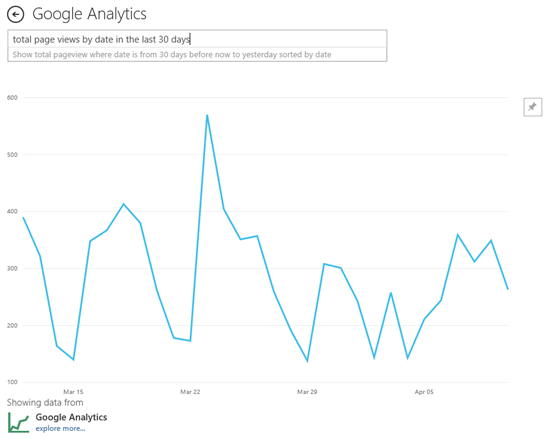 You can also use Q&A to explore your data, such as asking questions about the website traffic – “total hits” or “total page views by date in the last 30 days”. You can ask questions about specific data points as well, such as “total sessions by browser where device is a tablet”. Every result can be pinned back to your dashboard to customize it however you want. You can also pin data from other datasets to your dashboard. For example, if you’re tracking your mail campaigns using Marketo you can see the results of your latest campaign, right next to your site traffic. The Power BI Designer also allows you to connect directly to Google Analytics to build your own set of reports. This connector leverages the Google Analytics API, allowing you to access all the data provided when enabling Google Analytics for your site. 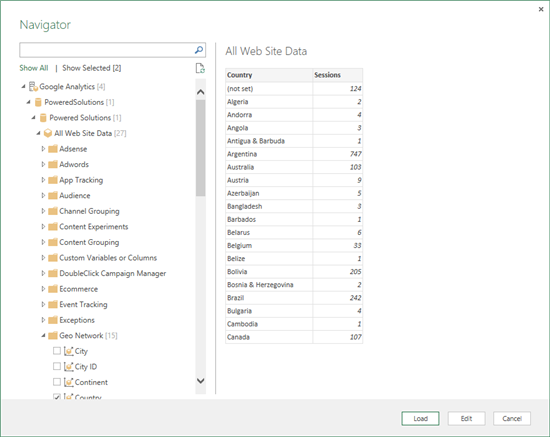 After selecting it from the list of sources, you’ll be prompted for your credentials and to allow Power BI to access your account. Once you connect, you’ll see a list of the accounts you have access to. Drill through the account, properties and views to see a selection of values, categorized in display folders. For example, try selecting Session > Sessions and Geo Network > Country to see the breakdown of session for the view by country. As you select different values, we’ll send a query back to the source to get the result. The output will be a single flat table will all the values you selected. Google Analytics has a limit on the number of items you can select together, so select the initial set and build as needed. Additional operations, such as filtering on the dates you selected, will also be sent in a query to Google Analytics. 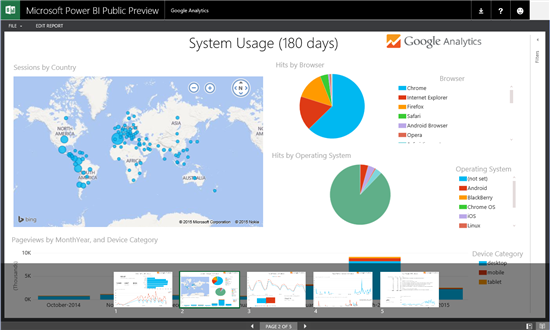 After loading the tables or switching to the Report view, you’ll be able to visualize and explore your data. Here’s a view that Miguel built himself, showing page views over time as well as by language and page title. 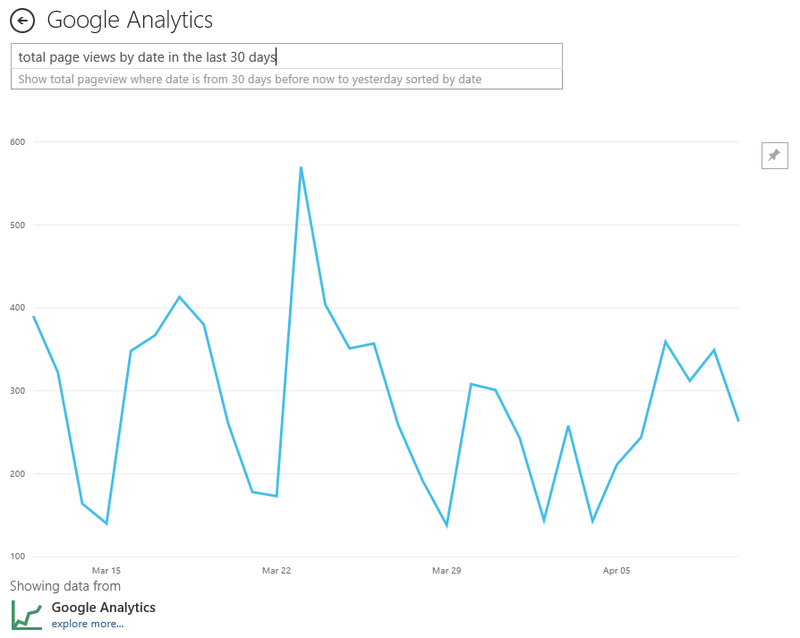 What will you built with the Google Analytics connector? We’re always interested in hearing your feedback – please leverage http://support.powerbi.com to let the team know how your experience was and if there’s anything we can do better. We look forward to your feedback!